Uruguay is a small country but nevertheless has an estimated population of approximately 500,000 horses. More than 37,000 horses were slaughtered in 2014 so the meat could be exported. Like people in the U.S., Uruguayans do not consume horsemeat; they consider horses as companion, sport and work animals. Horses are not commercially bred for meat production and there is no traceability regarding drugs that have been administered to the horse during its lifetime. The last owner of the horse simply has to sign an affidavit and confirm that the horse has not been given any restricted substances during the last 6 months. In addition, Phenylbutazone and many other drugs can be readily purchased without prescription for owners to administer to their horses. Uruguayan law also mandates that sport horses are specifically excluded from slaughter for human consumption, but it remains uncertain if this is truly the case. There are three horse slaughter plants in Uruguay, all of which are approved for export of horsemeat to the European Union. In 2012, Uruguay adopted regulations for the protection of animals at slaughter; however, enforcement is questionable at best and there is absolutely no legislation in place for animal welfare during transport. The vehicles that are routinely used are not appropriate for the transport of horses, especially over long distances such as slaughter horse shipments originating in Brazil. In addition to the horses that are legally imported from Brazil, hundreds or even thousands of horses are shipped illegally across the border. 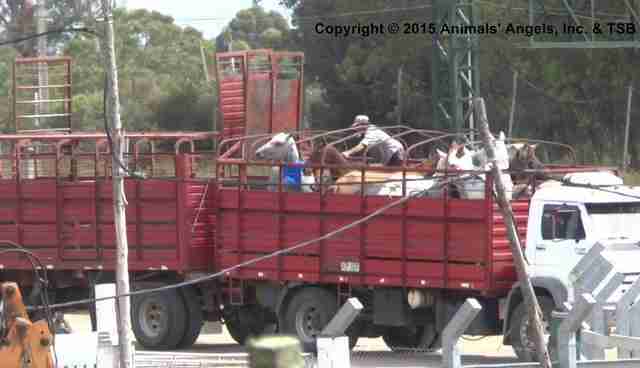 In Uruguay, horses have to stay 40 days at a registered "acopio" (collecting station) prior to slaughter. Before horses enter the "acopio", they have to get an ear tag for identification. The ear tag number has to be noted on the affidavit of the last owner regarding medical treatments during the last 180 days. If horses without an eartag arrive at a slaughter plant, they are supposed to stay 40 days at the plant before they can legally be slaughtered. However, investigations showed horses without eartags being unloaded straight at the plants, so enforcement of this rule is obviously unreliable. Behind this dilapidated slaughter plant building were some empty pastures, overgrown with waist-high bushes. Behind one of these bushes, investigators found a dead horse in an advanced state of decay. Next to the decaying carcass was another horse skull. There were several more skulls visible throughout the area. None of them had any bullet holes, indicating that the horses had been left to die instead of being euthanized. At this particular plant, horses are hosed down with a high pressure water jet, a procedure that greatly frightens the horses. As well, the worker often aims the water directly at their faces. In the chute that leads up to the entrance of the building, the horses are also moved with a high pressure water hose. Again, the water is aimed directly at the horses' faces, what makes them go back instead of moving forward. The floor of the chute is slippery from the water and from feces. Investigators observed a white horse slipping, falling, and struggling mightily to get up again. Investigators observed two groups of 10 horses being hosed down and moved up the chute. An electric prod was used on the horses first in line to make them enter the building. 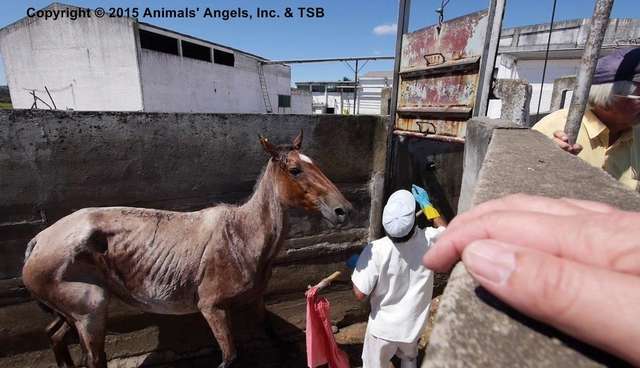 Several horses were in deplorable condition, severely emaciated with their ribs clearly visible. Many had scratches and abrasions on their bodies. Two horses had open cuts on their forehead and around the eyes; one horse had bleeding injuries along the spinal cord. Horses without eartags were slaughtered in clear violation of law. Loud noises could be heard from inside the plant and some horses in the chute showed strong signs of panic. 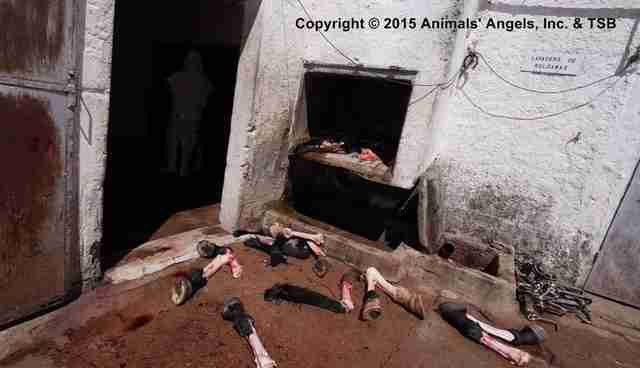 In addition, the severed legs of slaughtered horses were observed being discarded through an opening in the wall. There were several injured and/or lame horses observed on day of sale our investigators were present. One extremely thin horse could only bear weight on three legs and his left front leg seemed to be broken. This horse was not fit for transport and should never have been brought to the auction. A pony had what appeared to be a tendon rupture and severely overgrown hooves. A brown horse had a deep open wound at the right shoulder, and another horse had a wound on the left hip. A very young foal had abrasions on its body and head. Many horses had bleeding cuts and abrasions, which likely occurred during transport. Several horses were thin with their ribs clearly visible. About 10% to 15% of the horses did not have the mandatory brand mark. A severely emaciated gelding (a BCS of 1) which was extremely weak and should not have gone through the sale was indeed sold. As previously mentioned, the transport trucks are inappropriate for horse transport. Uruguay shippers use trucks with trailer compartments pulling another trailer that are open roof with no protection whatsoever from the harsh elements and with a high risk of head injuries. Many of the trailers observed at the auction were dilapidated with exposed sharp elements and worn-out, bad flooring. Adult horses were loaded with ponies and foals unsegregated for transport. Based on all of these observations, AA and its EU partners are calling upon the EU Commission to stop all horse meat imports from Uruguay. To read the complete, in-depth investigative report, please go here. To learn more about Animals' Angels, Inc. and their investigations, please visit their website here.